I’m trapped in some kind of terrible earworm hell. I thought yesterday was bad when I accidentally got “Chelsea Dagger” by the Fratellis stuck in my head. Today is much worse. 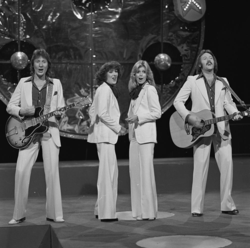 For some entirely unknown reason, I seem to have “Save Your Kisses For Me” by Brotherhood of Man lodged on a perpetual ten second loop in my brain. Just the chorus and the “bye bye baby, bye bye” bits. Over and over and over again. What do we know about this song? 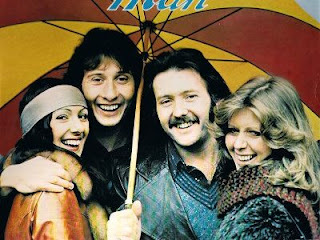 - It was the winning UK entry into the Eurovision Song Contest of 1976. - It is apparently the best-selling Eurovision winner EVER. - It was a number one single in Australia, Belgium, France, Ireland, The Netherlands, Norway, the UK and in the US Adult contemporary charts. - It is absurdly upbeat. - There’s a twist at the end. He’s singing to a three year old. So it isn’t what you thought at all, is it? Hmm? - Death may be is preferable to having this song locked on repeat on your internal jukebox. Any suggestions on how to shift it? I’m open to drastic suggestions. “Build Me Up Buttercup” is old faithful in situations like this, but today it just isn’t cutting the mustard and I may need to reach for a weapon’s grade earworm and to hell with the collateral damage. *I've just examined the video to the song and there is indeed an embarrassing dance that seems to mainly involve marching on the spot and bending your legs. I'm not learning it. Charlie don't dance.